Gujarat described as a vibrant state has advanced on nearly all the fronts including attracting foreign investment, implementation of new projects and politics in recent years. The state has received a receipt for its effort as the progressive state in India. 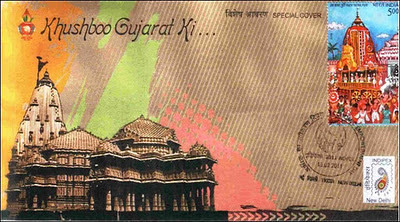 The latest stir is the move by Gujarat Tourism Board, sending “Khushboo Gujarat ki” a move to promote tourism in the state. In its initial stage itself it has made a good start by impressing the Hindi Film Industry, showcasing that the word is spreading fast. It was the appreciation to the untiring efforts of the team during the film producers meet in Mumbai. The result was encouraging as many film producers came forward with inquiries. Especially film producer Vishal Bhardwaj, preferred Gujarat for his further film shooting projects. Actually Bhardwaj was inspired by Uttar Pradesh as his location for the shootings. But Big B Gujarat’s brand ambassador having a strong reputation and good will in the industry was successful in convincing Bhardwaj about the peaceful atmosphere and the well behaved, patient crowd of Gujarat. Finally decision of Bhardwaj was welcomed with great cheers by the Tourism Corporation of Gujarat Ltd., and the shooting of the entire film 'Matru Ki Bijlee Ka Mandola' is supposed to be done in Gujarat. For promoting tourism the Gujarat Infrastructure Development Board has recently approved the sample concession agreement for tourism sector similar to Public Private Partnership model. This could be considered as the part privatization of the state's tourism sector including competitive bidding. The initial concession will be for thirty five years. The state is concentrating on its strongholds including business & convention tourism, coastal tourism, medical tourism, heritage tourism, religious tourism, weekend tourism and eco-tourism. The tourism department is said to be creating the basic infrastructure, training the service providers, bringing awareness in the local population, creating themes and strengthening local institutions. Last but not the least a vehicle called Gujarat Tourism Opportunity Limited (GUJTOP) is made available for this purpose. The ultimate aim is to create an atmosphere which will attract more tourists to the state. Amitabh Bachchan’s campaign of introducing the Rann of Kutch, in his own way was initially a success. The Khushboo crossed borders and brought some foreign guests also to the venue. But the other side of the coin was little bit different. The after impact of the event was bit frustrating to the foreigners as well as high spending domestic tourists. In their minds they had a feeling that the place once pristine was now unclean. One of the Embassy staff reacted very strongly towards the dirt and the unfavorable scenes on the road to the venue. The most important of all can be instead of spreading a good word about the place a bitter feeling rooted in the minds of the visitors which can prove to be a negative signal regarding the future of the project. The concluding part is that if the Gujarat government is really serious of its tourism goals they will have to be more serious in implementing basic things like cleanliness and pleasant surroundings which will build the base for tourism. Extra Comment: Plan Cheap Caribbean Vacation packages at Travel Universally.